You may wish to read an introduction to this section or a page on Medieval Ravenna first. The Venetians ruled Ravenna between 1441 and 1509. They left their mark mainly on the fortifications and the public buildings of the town. 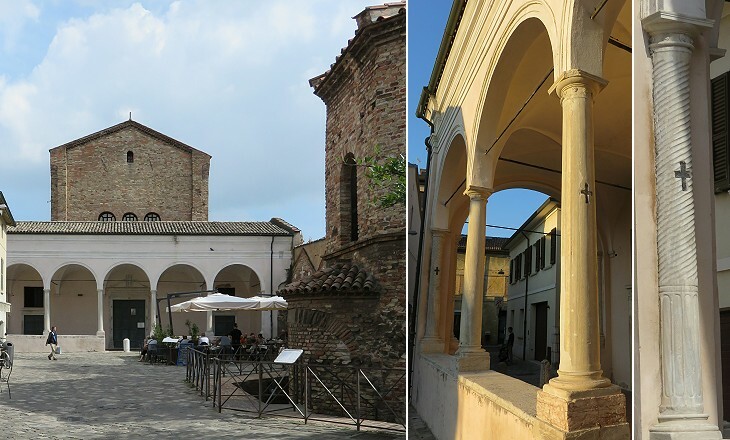 Two cloisters adjoining S. Francesco were most likely built during that period. This because the design of their wells is very similar to Venetian ones (e.g. a well near Palazzo Grassi at Chioggia). 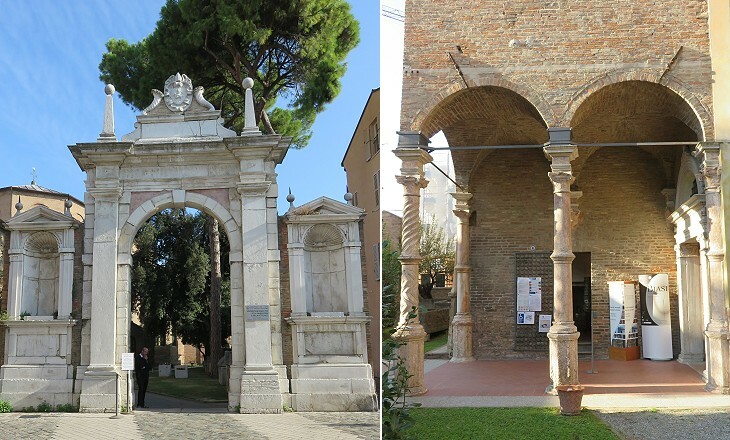 Ravenna had many ancient churches, but in the early XVIth century, when the town began to be ruled by a Legato, a Cardinal appointed by the Pope, many of them required urgent repairs, in particular because they had sunk into the ground. In some instances (e.g. at S. Vitale) it was sufficient to raise the floor, but in other cases, as at S. Spirito, the old church was greatly modified and given an entirely new appearance by the addition of a portico. Ceilings of the ancient churches were in poor shape and required action by the governors. S. Apollinare Nuovo was known as S. Martino in Ciel d'Oro until the VIIIth century. 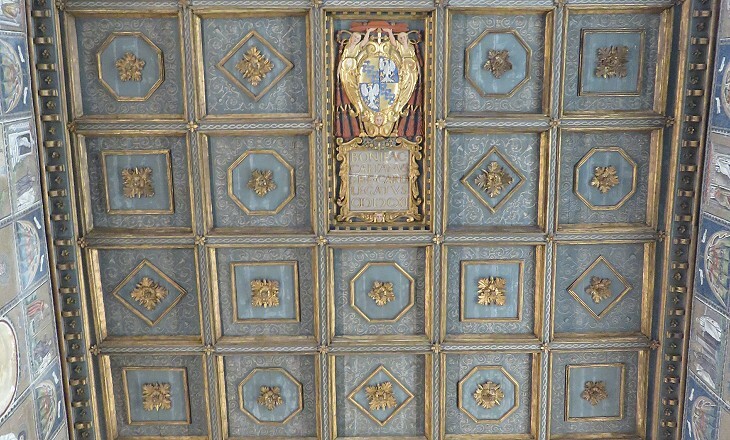 Ciel d'Oro means golden sky and it was most likely a reference to a lost mosaic which decorated the ceiling. 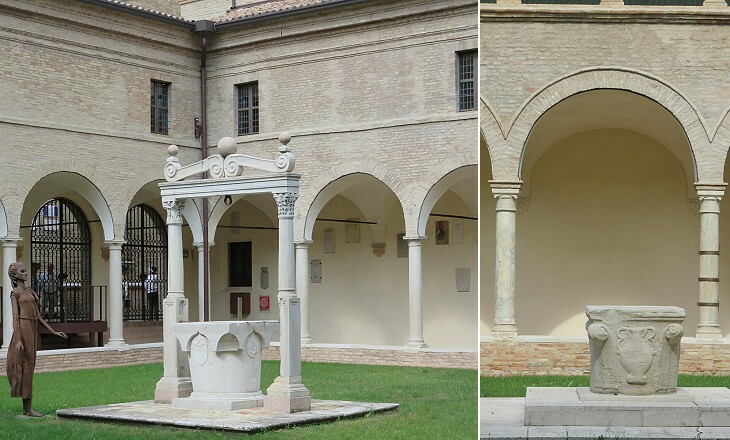 In general the ancient churches of Ravenna (with the exception of the Cathedral) were looked after with great respect, but changes and additions were made to some detached parts of their premises to give them a modern appearance. The Cathedral of Ravenna was one of the oldest monuments of the town as it was built at the end of the IVth century, but in 1733 it was decided to pull it down to replace it with a new building more in line with the taste of the time. The old cathedral had five naves and its apse was decorated with a mosaic of the XIIth century (or perhaps an older mosaic restored in the XIIth century) portraying the Resurrection. The mosaic was expected to be retained, but when the side walls were demolished, the apse collapsed. You may wish to see some ancient reliefs and sarcophagi inside the new Cathedral or the nearby Baptistery. 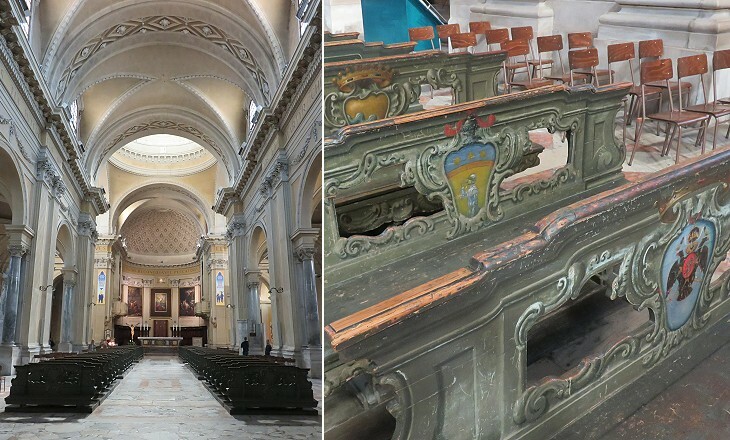 The Cathedral was built in line with the model designed by Gianfrancesco Buonamici, but in ca 1780 a dome replaced the octagonal drum of the original project, thus giving the interior of the building a very Roman appearance. A touch of XVIIIth century elegance was added by the painted benches where the noble families sat during ceremonies. The reconstruction of the Cathedral did not impact on the decoration of two chapels which had been added to the old building. Cappella del SS. Sacramento was designed by Carlo Maderno and its altarpiece was painted by Guido Reni. 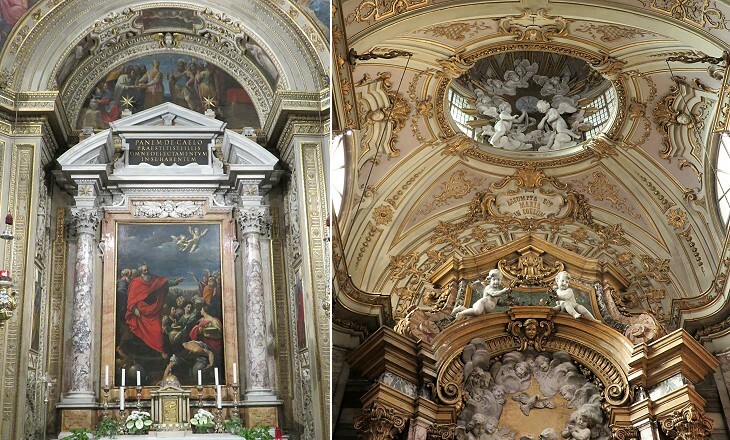 They were both leading artists in Rome and their involvement in the decoration of this chapel was requested by Cardinal Pietro Aldobrandini, Archbishop of Ravenna and nephew of Pope Clement VIII. Cappella della Madonna del Sudore (Sweat) houses a sacred image which according to tradition sweated blood when the French sacked Ravenna in 1512. It is the work of local craftsmen, but its decoration can withstand comparison with that of some of the richest churches of Rome (e.g. S. Caterina da Siena a Magnanapoli). Cappella di S. Francesco is another example of highly decorated chapel added to an ancient church of Ravenna. 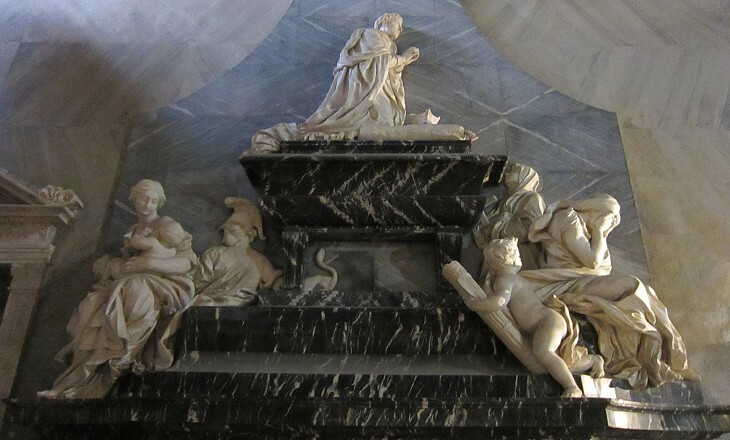 In 1647 Cardinal Lorenzo Raggi was one of the relatives who commissioned Gian Lorenzo Bernini the Monument to Maria Raggi in S. Maria sopra Minerva. In 1654 in that same church Bernini designed the Monument to Cardinal Domenico Pimentel (it opens in another window). 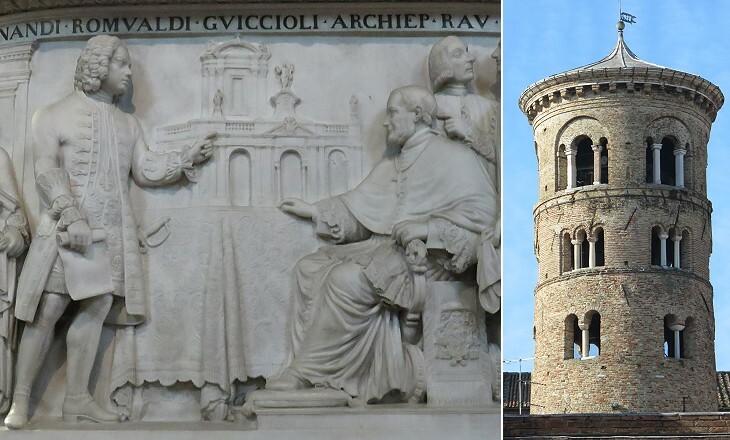 It must have impressed Cardinal Raggi, because he decided to be buried in a very similar monument. 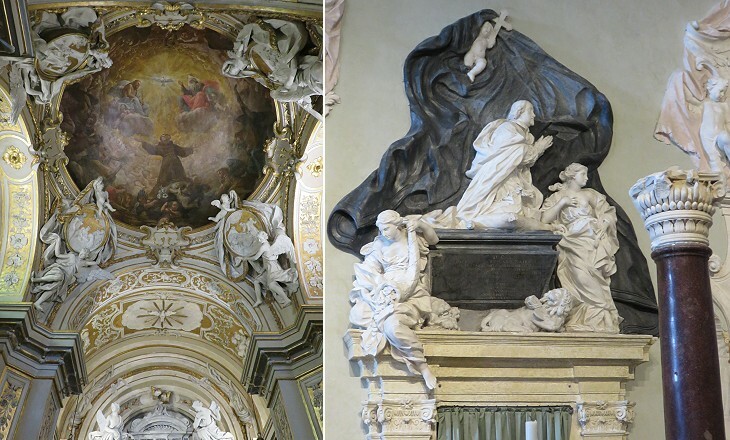 You may wish to see other Baroque monuments where the dead is portrayed in the act of praying. In some particularly silent and grassy corner, rises an old brick church with a front more or less spoiled by cheap modernisation, and a strange cylindrical campanile pierced with small arched windows. S. Giovanni Battista was not an ancient church as it was most likely built in the IXth century, but it was in danger of collapsing when in 1683 it was replaced by a modern one. 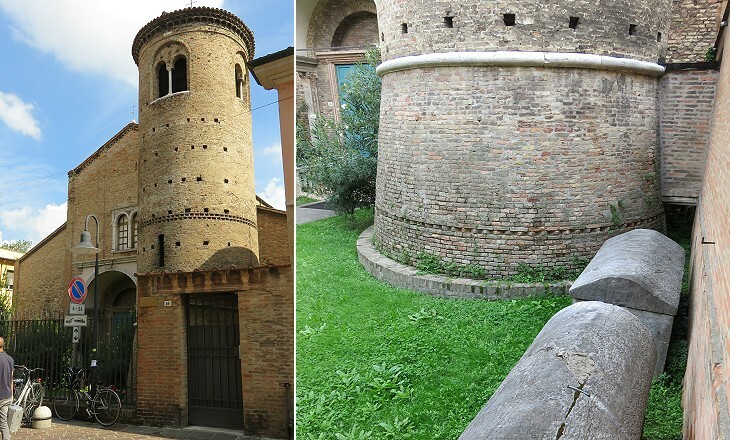 S. Agata Maggiore ought to have been covered with other monuments of Ostrogothic Ravenna because it was built in the late Vth century, but it has undergone so many changes (and modern restorations) that the current church has the aspect it had in the XVIth century. The bell tower was built in 1560 and its lower part is tapered. This feature was aimed at preventing it from leaning. 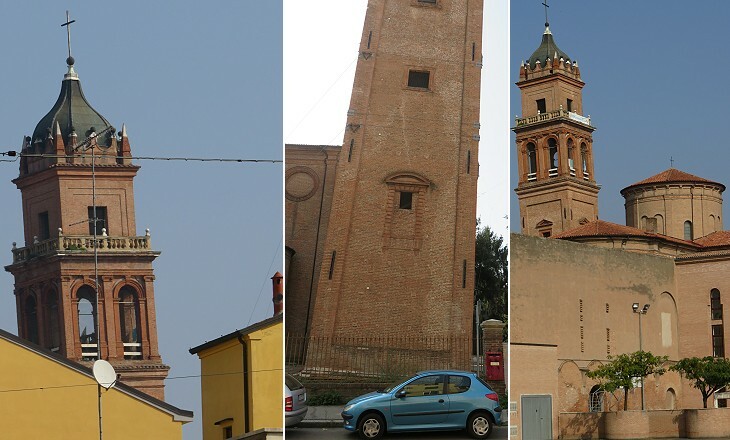 Many of the locations covered in this section have bell towers which lean, but not as much as that of S. Benedetto in Ferrara (it opens in another window). 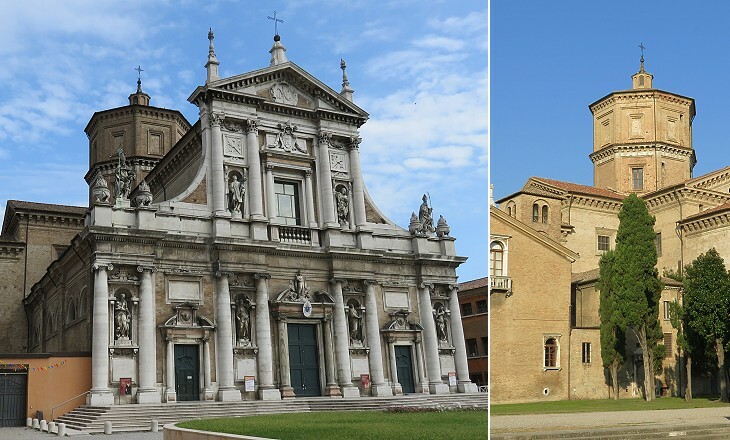 In the XVIth century citizens and rulers of Ravenna felt the need to have a new grand church which was not linked to the glorious past of their town. 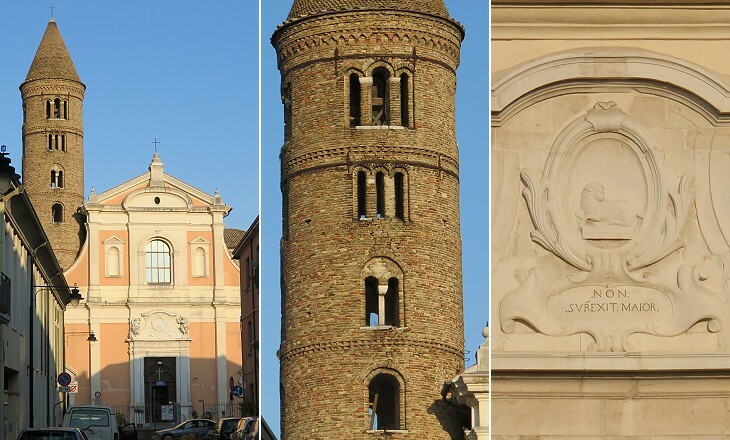 In 1553 the Canons Regular of Lateran began the construction of a large church and an adjoining monastery near Porta Nuova from where the road to Classe, the harbour of Ravenna once started. 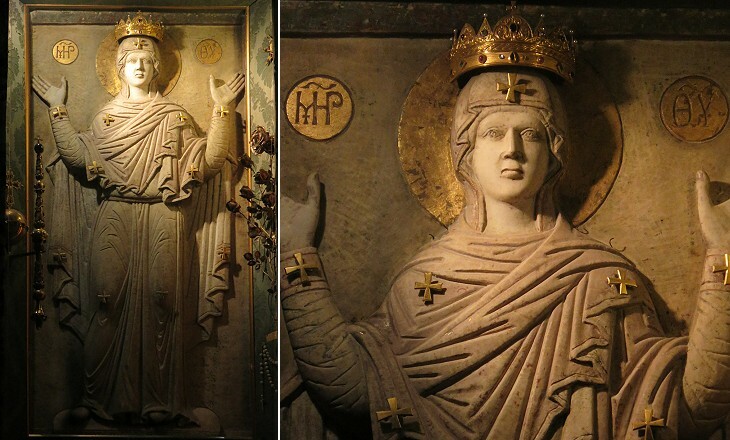 S. Maria in Porto: "Madonna Greca" (Xth century); the Greek words (transliterated as Meter tou Theou) at the sides of the head mean "Mother of God"
The new church was built to house a sacred image which according to tradition came from Constantinople and resembles some stucco statues at Cividale. The relief was kept until 1503 in a church by the same name near S. Apollinare in Classe, which the Canons had to abandon because the whole site was marshy and very unhealthy. The rear side of the monastery was embellished with an elegant double loggia which was built by stonecutters from Lombardy, hence its name. 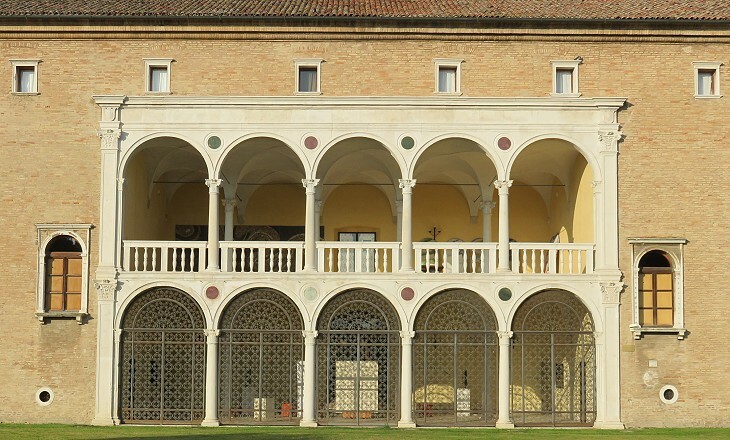 Today the monastery houses Museo d'Arte della Città di Ravenna (external link - it opens in another window). 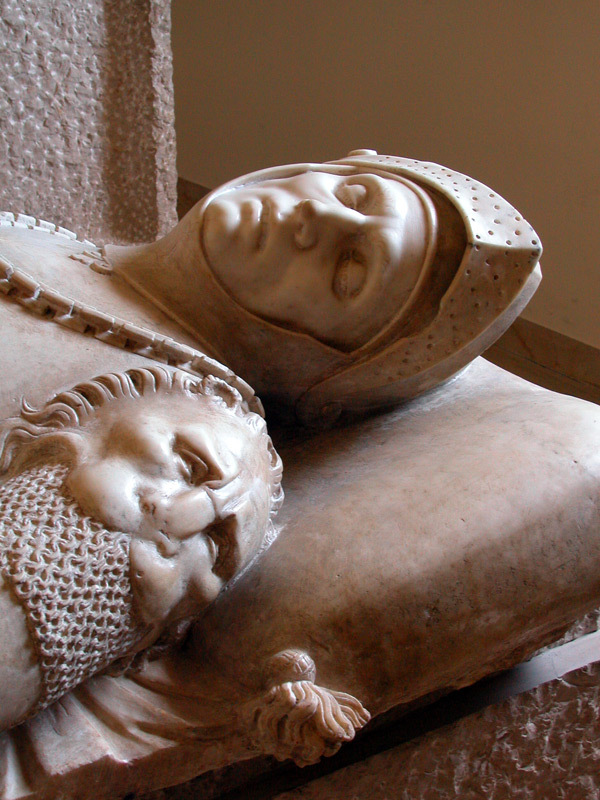 Its collections include the 1525 recumbent statue of Guidarello Guidarelli by Tullio Lombardo (it opens in another window) which many women used to kiss. 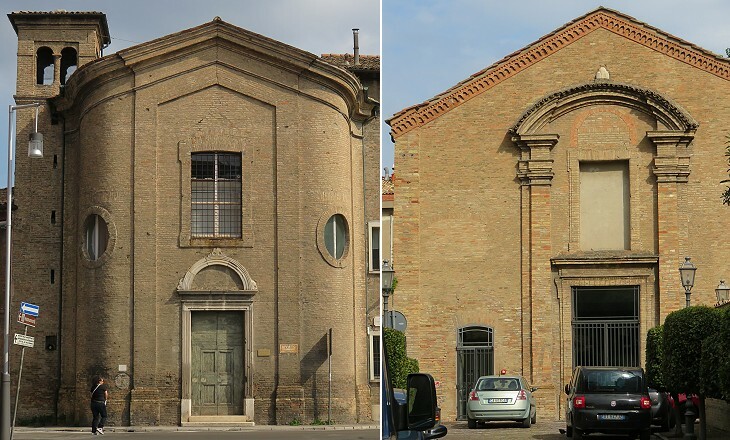 An overview of religious buildings at Ravenna must include a number of minor churches such as S. Giustina and S. Maria del Suffragio which were built by brotherhoods. 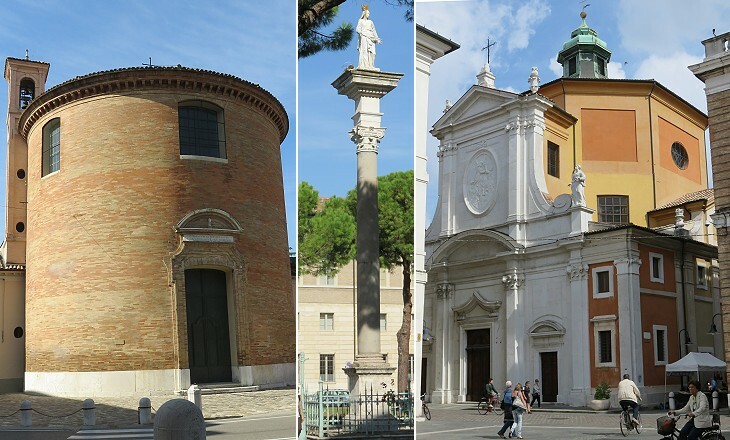 Colonna della Vergine was erected opposite the Cathedral to thank the Virgin Mary for the end of a major pestilence. In Rome the end of that pestilence was celebrated by building S. Maria in Campitelli.